A report published recently by a British newspaper, 'The observer' has managed to cause much heartburn in far off China. According to this report, an humble farmer from a village known as 'Darveshpura' from Nalanda District of the state of Bihar, in India, has created a world record in rice production. Mr.Sumant Kumar, a rice cultivator from Bihar, one of the poorest states of India, grows rice in his field near Sakri river. This year, rains have been plentiful in Northeast India and he was expecting a bumper crop compared to his normal yield of 4 or 5 tonnes per hectare. When he harvested his rice this year, he found that every stalk of rice seemed to weigh heavier and every grain of rice was also bigger. After his crop was weighed on old village scale, everyone including Sumant Kumar himself could not believe what they saw. 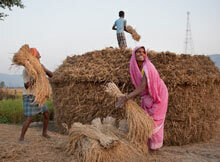 The yield was 22.4 tonnes per hectare. Sumant Kumar's unbelievable success was repeated, though on a modest scale by his friends, Krishna, Nitish, Sanjay and Bijay, who had managed to get a yield of more than 17 tonnes. 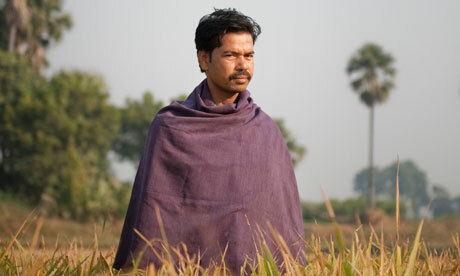 Sumant Kumar's yield had broken all world records so far including the 19.4 Tonne record achieved by the "father of rice", the Chinese agricultural scientist Yuan Longping, World Bank-funded scientists at the International Rice Research Institute in the Philippines, and anything achieved by the biggest European and American seed and GM companies. No one was ready to believe in what Sumant Kumar had managed to achieve except for the farmers from his village. Bihar state agricultural universities also didn't believe it at first. India's leading rice scientists named it as freak results. Some people accused the Nalanda farmers of cheating. However, when the state's head of agriculture, a rice farmer himself, came to the village with his own men and personally verified Sumant's crop, the record was confirmed. Using only farmyard manure and no herbicides, Sumant Kumar and his friends have achieved his extraordinary yield by adopting the system of rice intensification (SRI). Traditionally, farmers around the world, plant three-week-old rice seedlings in clumps of three or four in waterlogged fields. Darveshpura farmers carefully grow seedlings from only half as many seeds, and then transplant the young plants into fields, one by one, when much younger. Instead of planting in clumps of three or four seedlings, the farmers here space them at 1 inch intervals in a grid pattern and keep the soil much drier. Any weeds around the plants are carefully removed to allow air to their roots. It was a French Jesuit priest and agronomist, Henri de Laulanie, who, after observing how villagers grew rice in the Madagascar uplands, developed the method of SRI cultivation in 1980. However, professor Norman Uphoff, director of the International Institute for Food, Agriculture and Development at Cornell University, was largely responsible for spreading the word about De Laulanie's work. In January 2013, Nobel prize-winning economist Joseph Stiglitz visited Nalanda district and recognised the potential of this kind of organic farming, telling the villagers they were "better than scientists." SRI seems to work not only with rice but with almost all plants. Six month after Sumant Kumar's triumph, his friend Nitish Kumar smashed the world record for growing potatoes, when he harvested 72.9 tonnes of tuber per hectare. The world record so far was 45 tonnes per hectare held by farmers in the Netherlands. Shortly after that, Mr. Ravindra Kumar, a small farmer from a nearby village from Bihar, broke the Indian record for growing wheat. As news of his record breaking yield spread around, Sumant Kumar became a local hero. He was mentioned in the Indian parliament and asked to attend conferences. Bihar's chief minister came to Darveshpura to congratulate him, and the village was rewarded with electric power, a bank and a new concrete bridge. This village, now known as India's "miracle village”, has became famous and teams of scientists, development groups, farmers, civil servants and politicians are all visiting it to discover it's secrets. The report in 'The Observer' mentioned above, however appears to have caused acute heartburn in China. On 20th February 2013, South China Morning Post reported that China's most revered agriculture scientist, Yuan Longping, has slammed the British news report. Dr. Yuan Longping, a national icon, is known in China as “the father of hybrid rice” for developing varieties that enabled China to transform its grain output. 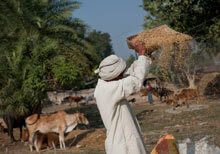 His rice varieties were subsequently introduced widely in the world, and marked a record yield of 19.4 tonnes a hectare. He has described as “120 per cent fake” the claims that farmers in Bihar have harvested a world record 22.4 tonnes of rice from one hectare of land without using herbicides or genetically modified (GM) seeds. Perhaps Dr. Yuan Longping has no idea about conditions in India, where faking such kind of agricultural reports, would be an almost impossible task to achieve. India is not China, where reports published by some Government department, are taken as Gospel truth by everyone. (Like 2002-2003 SARS epidemic, when Chinese Government claimed in reports that there were no cases of SARS in China, but in reality the disease was raging everywhere.) India is a free country and anyone in the world can go and check the facts himself. Dr. Yuan Longping need not wait for another year. He can make the trip right now to satisfy himself. As many as hundred thousand other SRI farmers in Bihar are now preparing their next rice crop along with their heroes, Sumant and Nitish Kumars of Darveshpura. with tremendous confidence and optimism for the future buoyed by recognition and results. It is quite possible that they may not see breaking of another world record because conditions last year might have been more than ideal and could have assisted the yield. But even if they can double or even increase crop yields by even 30%, They would effectively answer all the doubting Thomas’s. Hats off to India's farmers, who after Green revolution of 1970's, have done it again, using a brand new technique, SRI.